What Shall I Wear? 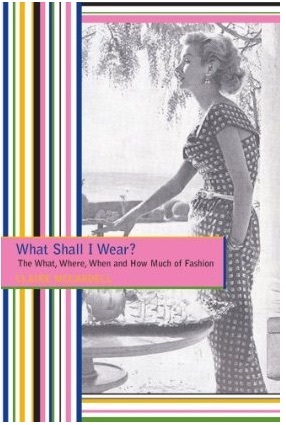 is probably one of the most seminal books in fashion, at least for me. I'd rank it right up there with Fashion is Spinach, and that's saying something. It was supposed to be released today, but Amazon is already showing it's out of stock — I'd order it now to be sure of getting one! Copies of earlier editions sell for well over US$100. "For me, it's America—it looks and feels like America. It's freedom, it's democracy, it's casualness, it's good health. Clothes can say all that." The whole book is inspiring. I heartily recommend it. Weirdly, we only have one pattern tagged "Claire McCardell" on the wiki. Hmm. I'll have to see what we can do about that! Oh, dear, this now makes Number 513 on my Amazon Wish List . . . ! Random, but why is she slouching? Someone should have smacked her between her shoulder blades. Just saying. Shes slouching toward Gomorrah, Packrat. Btw, I tried to find this book in the Chicago Public Librarys online catalog. Nothing! Drats. Yes, her posture is insane. I wish someone would write a history of fashionable posture and deportment because those round-shouldered Victorian belles are pretty messed up too. Not in Erins new county library system, either. Your November 11, 2008 entry is also a McCardell, but it is not tagged as such. My back hurts just looking at her! Guess this is one reason vintage clothing can fit so oddly. Frim what Ive seen almost all of the models stances where like that back then. They would pitch their pelvis forward and curve their shoulders forward. Have no idea why. Thanks for posting about this, Im off to order it now. It looks like its available again! That posture is what was called the debutante slouch. Tres chic in its day. The debutante slouch? Did young ladies actually go to school to learn it as part of learning to sit and walk correctly?When I first saw it I thought it had something to do with her underpinnings. I actually just picked up a book about Claire McCardell today at the library. They have this book too, but its a reference book, darn it, and doesnt circulate. Id have to go downtown to get it. Must order the new one. Wow, would love, love, love to get my hands on that book! I love the pattern that is on the wiki. Her slouch is no worse than the wieid way Paris Hilton always poses in pictures. Lisa–whats the title of that other book you got? Thank you for the link to Fashion is Spinach – simply perfect reading for my upcoming holiday. Ummm….My Baker Taylor book vendor account says that the book has been cancelled! My Ingrams BWI vendor accounts dont mention that, so Im hoping its not true. Ive been looking for this book forever too, and I know that someday Ill find an original on the shelves of my local used bookstore. In the meantime, Ive ordered this one, just because. I just got the cancellation email from Amazon for this. They dont know if they will ever be getting any more in. There is one used copy available for $999.99 however!!!! Disappointment!! !